Este tanque medio experimental se desarrolló y puso a prueba entre mayo de 1942 y febrero de 1944. Nunca se fabricó en serie ni apareció en ningún campo de batalla. Much like the M4A3E8 Sherman, the T20 lacks significant armor. Able to sneak around the battlefield, the T20 is an excellent support tank, able to switch between engagements in very short time. Its thin armor is a serious weakness, and caution must be taken to avoid enemy fire whenever possible. Pick different strategies to match differing opponents: flank heavy tanks, ambush and brawl mediums, track and destroy lights. Passive scouting is very viable when normal scouts are not available. Best gun for its tier: good alpha damage, above average penetration, good accuracy and a surprisingly fast aim time. Great APCR round allows the T20 to pen many T9s with ease. Good view range for its tier. The T20 armed with the 90mm is a potent mobile medium. It has significant firepower, can penetrate higher tier enemies, and has the accuracy to allow you to snipe enemies from range. The T20 can utilize terrain very well with the high gun depression, and good fire control + alpha means it only needs minimal exposure. Its mobility should be used to avoid enemy fire and flank enemies. It can circle slow heavies as well, although the M4A3E8 may be better in this role as it traverses faster. Late in the game you can rely on your top speed to hunt artillery or reset the cap. Also, be aware of the excellent view range and camo on this tank - you can easily see many tanks before they ever catch wind of you, so long as you remain hidden. This is made easier with the low profile as well. Repair skills are highly recommended, at least 2 crew should be fully trained in this. A tracked T20 will receive heavy fire and shells from artillery, so Repair skills are essential for survival. If playing as a mid-range sniper with the above-average accurate 90mm, Sixth Sense and some Camo skills will help greatly, allowing you to know when to relocate and hide better. If using the T20 as a flanker, Snap Shot and Smooth Ride/Offroad Driving will reduce accuracy penalties and increase mobility even more. If all of these skills are met, it is recommended to get Brother in Arms for all crew members, which will increase every desirable stat on your tank to even greater heights. The T20 can, in a pinch, passive scout very well, especially in open maps. When armed with a Camo Net and Binocular Telescope/Coated Optics, this tank can even spot enemies better than many (all if they do not have any equipment) tier 9's. To help with this tactic, the T20 has a very small profile. Scouting in this tank is very similar to scouting in the T21, except this tank has a far better gun, more HP, and looks a lot more attractive, the downside is that the T21 is a light tank and thus gets the respective bonus of camo on the move. The slight difference in speed between the two tanks is negligible, so even if a player despised the T21, the T20 can still be well liked. Overall, the T20 is a great asset and threat when played correctly, and should not be underestimated. 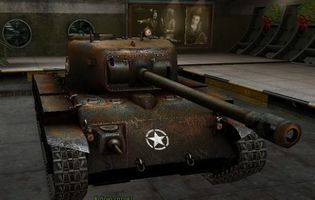 Considered by many as the best tier 7 medium for good reason, it possesses many of the strengths one desires from a medium tank, and is a pleasure to play. The 76 mm Gun M1A2 carries over from both the M4A3E8 Sherman and the M4A3E2 Sherman Jumbo. Install the M1A2 and the familiar SCR 506 radio immediately. First research the Ford GAN engine. Then research the upgraded suspension. Now research the second turret, and then the 90mm gun. Much like other armies at the time, the U.S. Army envisioned two main roles for tanks: infantry support and breakthrough exploitation. From 1942 until the end of World War II, both roles were covered in the main by the M4 Sherman, which was better suited for the latter "cavalry" role. The infantry would have preferred a better protected and better armed vehicle, even at a price of less mobility. In late 1942, U.S. Army Ordnance started to work on an "infantry-oriented" design which was supposed to be more versatile than the British infantry tanks. During the next two years, various prototypes were built under the designations T20, T22, T23, T25, and T26. Starting with the T20, the Ordnance Department initially developed three series of improved medium tank prototypes, the T20, T22, and T23. The main differences between the T20, T22, and T23 lay in the choice of transmission. The T20 used a torque converter fluid drive, the T22 a 5-speed mechanical drive similar to the M4 drive, and the T23 used an electric drive. Additionally, the T20 had an early version of the HVSS suspension later employed on the M4 Sherman, whereas the T20E3 had torsion-bar suspension. All moved the transmission to the rear of the vehicle, eliminating the need for a drive-shaft running the length of the vehicle. The drive-shaft used in the M3 & M4 vehicles forced the turret to be mounted higher, thus increasing the vehicle height. However, the initial success of the M4 led the Army Ground Forces command to believe that there was no urgent need for a new tank. Even with the appearance of the heavy Tiger and medium Panther tanks, the AGF did not alter its position, believing both tanks would be fielded in relatively small numbers. AGF was correct about the Tiger, a specialized heavy tank that was never encountered in large numbers. The Panther, first encountered in small numbers at Anzio, however, was built in very large numbers and formed half the German tank strength in Normandy. Also, according to the Army doctrine of the time, tanks were not supposed to engage other tanks; this was the remit of tank destroyers, more mobile armored vehicles with powerful guns, such as the M10 Wolverine. As a result, the development of the new tank was slow. When the Allies invaded western Europe during Operation Overlord in June 1944, the M4 still formed the bulk of American tank units. It quickly became clear that the tank destroyer doctrine failed in the field and that the up-gunned Sherman was unable to engage the Panther on equal terms. Efforts were made to speed up development, but the tank, by now called the T26 and dubbed Pershing, reached the battlefield only in February 1945 and saw very little action in WWII.